Orthodoxy was first established in Indonesia in Batavia, Java as a parish of the Harbin Diocese in accordance with the Ukase of the Harbin Diocesan Council of November 23, 1934, № 1559. In the late 1940's, the parish was under the omophorion of Archbishop Tikhon of San Francisco. Unfortunately, after the Dutch relinquish their powers to the local leadership, many of the Russian parishioners have already fled during this period of civil unrest, and eventually the parish closed in the early 1950s, when its rector Fr Vasily immigrated to the USA. The following is an online interview conducted by orthodox.cn with Fr.Dionysios (and his wife Presbytera Artemia Rita), one of the six newly ordained priests in Indonesia. Orthodox.cn: The rebirth of Orthodoxy in Indonesia is widely attributed to Archimandrite Daniel B.D. Byantoro, a Muslim Indonesian who converted to Orthodoxy in the 1980s. His missionary effort eventually brought official government recognition of the Orthodox Church in Indonesia in 1996 (with a legal act of Government:" SK Dirjen Bimas Kristen Depag R.I. no. : F/Kep/Hk.00.5/19/637/1996"). Can you tell us how Orthodoxy has grown since then in this predominately Muslim country? -Fr.Dionysios: When Archimandrite Daniel Byantoro (who has some Chinese among his ancestors) started his mission in Indonesia, he was not aware that there was an Orthodox presence prior to his conversion and his mission efforts in Indonesia. This is because what you mentioned about the Church in Batavia (Old Jakarta) happened before Indonesian independence and before the country was called Indonesia. Besides, it was not mainly a mission Church for the Indonesians, but a foreign Church catering to the Russian people. Therefore, as Archimandrite Daniel Byantoro has said, our mission, when viewed in the light of the recent connection to the Church of Russia, is indeed a "rebirth" for the Orthodox mission, but being completely independent from any foreign mission endeavor, it is also completely new "phase of modern mission" movement within Orthodoxy. For it is being done by a local son of the Indonesian soil rather than by the missionary efforts of a foreign mission body. It is the Church for the Indonesians started by an Indonesian. Archimandrite Daniel Byantoro learned that a Russian Orthodox Church existed in Batavia (old Jakarta) during the last years of the Dutch colonial government in the Dutch East Indies (Indonesia) and the first years of Indonesian government only after he had contact with Archbishop HILARION of Australia. Before that he knew nothing about it. So there is no direct organic connection between the Russian Church in Batavia during the Dutch colonial era and the present indigenous movement of the Indonesian Orthodox Church among the people of Indonesia. 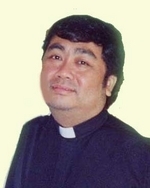 The separate histories, the one in the Batavian era and the other in modern Indonesia, are connected by way of the recent ordination of the new priests by Archbishop HILARION. Right from the very beginning of his mission, Archimandrite Daniel Byantoro has been conscious of the ethnic diversity of Indonesia, and he made the point from the very beginning that, as part of his mission policy, there has to be an Indonesian-Chinese cultural expression for Orthodoxy in Indonesia in addition to his concentration on the Javanese cultural expression in the city of Solo where he started his mission. And of course there has to be a national expression in the Indonesian language as well. Unfortunately, during the early phase of the mission, there were not many Chinese members who came to the faith. 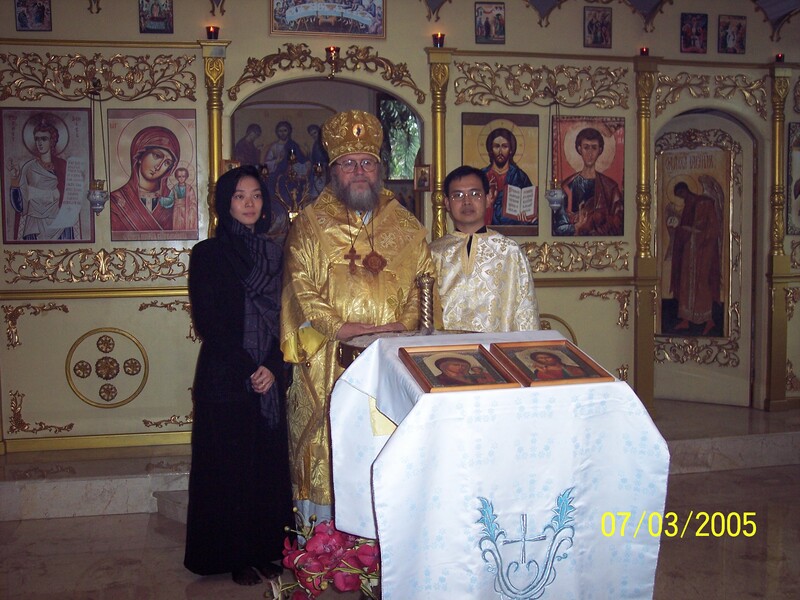 The only Chinese descendant for whom Archimandrite Daniel Byantoro expected to develop the Chinese-Indonesian cultural expression of Orthodoxy was himself. Yet he was culturally more Javanese than Chinese, because he grew up in Java among the Javanese. Archimandrite Daniel Byantoro, who has a Chinese name "Chao Heung Jin ( Cáo Héngjìn 曹衡进)", himself has made efforts to learn the Chinese language. Because of time constraints, he had to abandon the effort, but he is fluent in Korean. However, with the recent marriage of Fr Kyrillos Junan Iswaja (himself a Chinese) before his ordination, Fr Daniel has given us guidance on how to keep the Indonesian-Chinese wedding custom within the context of Orthodox practice without changing the Liturgical tradition of the Church. It was a very beautiful combination. Archimandrite Daniel Byantoro provides us with much guidance on how to incorporate the Indonesian-Chinese (or other Indonesian ethnic) cultural expression within Indonesian Orthodoxy, and we are going to implement it slowly when the time comes. He has also done similar things with the introduction of some Javanese cultural expressions into Orthodoxy. Archimandrite Daniel Byantoro has an academic background in cultural anthropology and at present is teaching world religions and cultures at Ohio State University, in Columbus, Ohio, USA. He also knows seven languages and is beginning to learn Russian. It will be his eighth language. The guiding principle that helps Archimandrite Daniel Byantoro accomplish his mission is the "Incarnational" approach, which means that the Gospel has to be incarnated within the context of the local cultures, languages, financial support and leadership. The great principle of Nevius, a Protestant missionary to China, is very compatible with this incarnational approach. The Nevian principle states that, in order for any mission effort to be successful at all, it has to fulfill the criteria of "self propagation" (the proclamation of the gospel has to be done by local people with local expression), "self-supporting" (as early as possible the local people have to be able to support themselves financially so that they will not depend upon foreign aid all the time, which results in an unhealthy dependency on the foreign leader rather than the local people) and "self-rule" (as early as possible after proper training the leadership of the Church has to be relegated to the local people, so that it is not under the dictate of foreign interests and power). With the bitter history of colonialism from which Indonesia has freed itself, it is imbedded deep within our psyche to detest and to loathe any sign of colonialism, whether it is political, religious or cultural. Anyone who wants to do mission work in Indonesia while disregarding this Indonesian cultural psychology will be bound to fail in his endeavor. The Indonesian people will revolt against anything that they smack of foreign religious-cultural colonialism (whatever and wherever it comes from). The vision of Archimandrite Daniel Byantoro, which has also become our vision, is that there has to be an indigenous Indonesian Orthodox Church, not an implanted outside culture, interest and power in Indonesia. Any foreign power and cultural imposition will be deemed unacceptable. We want to become Orthodox as Indonesians, we don't want to become what we are not. Our interest is not in foreign culture, we are only interested in the " Orthodox Apostolic Faith" of the Church, pure and simple. Therefore the plans and visions of the mission work for Indonesia were not something incidental, but had been contemplated for a long time by Archimandrite Daniel Byantoro, even when he was still a student in Korea. They became more intense when he was at Mt. Athos. He was already well taught in his former Protestant Seminary in Korea (which is an affiliate of Fuller Theological Seminary) on the principles of indigenization and inculturation of the Gospel. He knew his culture, and he wanted to express Orthodoxy within the contexts of his own culture. And he found that the history of Orthodoxy and many features of Orthodoxy are conducive toward implementing that kind of indigenization and inculturation. It was on Mt. Athos that he started to translate the Divine Liturgy into the Javanese language and write the first Orthodox theological treatises in that language. Also during his stay on Mt. Athos, he started to create and coin new terms for translating many Orthodox terms that had not existed within the language. When the newly created terms sounded too awkward and strange, he resorted to using the original Greek terms side by side with them, such as using "Theotokos" alongside "Sang Pamiyos Widdhi." Theologically speaking, Archimandrite Daniel Byantoro also used the existing thought patterns of Indonesian culture to package Orthodox teaching within the Indonesian mental set up. Just as the Church Fathers had to face Greek paganism, Judaism, and Gnosticism in order to present the Gospel intelligibly to ancient peoples, Orthodox theology faces similar challenges in the context of the Indonesian mission. The Islamic strand that has similarities with Judaism. The Hindu-Buddhistic strand that has similarities with Greek paganism. The secularistic-materialistic strand of the modern world. The first three strands have made the Indonesian people intensely religious. Into this religious and theological climate, the Patristic approach to ancient Greek paganism, Judaism and Gnosticism has provided, for the present writer, a paradigm to deal with all those strands inherent in Indonesian culture. In this regard, Orthodoxy must build trust among religions in Indonesia before it can have any significant influence. By maintaining a harmonious relationship with other religions existing in the country, Orthodoxy can contribute toward combating the pernicious influence of materialistic secularism. In term of Orthodox religious practices, there are religious practices that cannot be described as belonging to any particular religion in Indonesian culture. They are practiced all over Indonesia, and although they have many different names and some slight variations in practice, they basically have the same pattern. These practices include fasting, ascetic labor, communal meals, prayer for the dead, and the keeping of relics. Archimandrite Daniel Byantoro had to deal with these cultural religious practices carefully, in order that Orthodoxy be acceptable to the Indonesian people. For example, the practice of sitting on the floor for religious purposes is adopted in the worship of the Church in Indonesia. "Coned rice" instead of kolyva is used for commemorating the dead, since Indonesians do not eat bread as their main staple and do not grow wheat. The prayer of the Trisagion is used to replace the traditional Indonesian practice of honoring departed ancestors. Women wear veils in the Church, as was traditionally done by Orthodox people, but also conforms to the idea of the pious woman in the Indonesian culture. Icons and relics, with a right Orthodox and biblical understanding, have replaced amulets and heirlooms. Communal meals are usually done during festivities in the Church, as well as during Lent, where everybody breaks their fast together in the Church after Pre-Sanctified Liturgy. Some cultural symbolism has been adopted as well for the usage of the Church, such as the usage of young coconut leaves for decorating the Church building during festivals and feasts. The first thing Archimandrite Daniel Byantoro did when he arrived back in Indonesia to start his mission was to form an evangelistic foundation named "Yayasan Dharma Tuhu" ( "Orthodox Foundation") and then changed into "Yayasan Orthodox Injili Indonesia" ( "Indonesian Evanglistic Orthodox Foundation"). This foundation later became what we know as the "Gereja Orthodox Indonesia" ("The Indonesian Orthodox Church"), an umbrella organization for all Orthodox jurisdictions if they want to be legally recognized when operating in Indonesia, of which Archimandrite Daniel Byantoro is the president to date. It is the only legal Orthodox organization, and Archimandrite Daniel Byantoro is the only legal president and founder of the organization. No foreigner is allowed to be a head of any religious organization in Indonesia. Proclamation of the Gospel in its wider sense, namely, through preaching, Bible study, direct personal evangelism, friendship evangelism, the distribution of literature, radio broadcasting programs, seminars, socialization, and mission travel. Preaching means not only what we do during Liturgy in the Church, but also preaching about Orthodoxy at non-Orthodox gatherings, such as during the Christmas festival, during family gatherings, during marriage ceremonies and so on, so that a wider audience will be introduced to Orthodoxy. Bible Studies are done not only within Orthodox communities, but also done for everybody who is interested to hear. During such Bible studies conducted by Archimandrite Daniel Byantoro, between 50-100 non-Orthodox people usually come to attend. Direct personal evangelism has been done by many of our priests. It is done through house-to-house visitation, or when meeting someone on the road, at shops, or at any place the priest or the Orthodox person happens to meet people. It can be done also through personal friendships with non-Christian or non-Orthodox. We are also sending literature and books to interested people within the city, outside the city, within the island, and outside the island. Sometimes we also sell that literature to other people. The translation of liturgical books is still being done because we have not finished the Menaion, the Festal Menaion, the Triodion, Pentacostarion, and the Paraklitiki / Octoechos. Archimandrite Daniel Byantoro, in spite of his busy schedule in the USA, is still doing the translation of the Liturgikon, Eirotelestikon, the Great Horologion, and the Liturgy of St James. In the Jakarta area, a radio program was started with the Archimandrite Daniel Byantoro as the speaker and an occasional radio program is also done in the city of Solo. The Church in Solo has a vocal group that accompanies such a program. Seminars on Orthodoxy were done only occasionally because it costs a lot of money, especially to rent a space in a big hotel. The seminars target people in the middle to high-class levels of society. Last but not least, in order to open the possibility of new mission areas in this huge country of Indonesia, Archimandrite Daniel Byantoro has done mission travels to different parts of Indonesia, such as to Kalimantan (Borneo), to West and East Sumatra Island, and to Timor Island. The first thing he did was the translation of liturgical and theological books for the purpose of teaching, and most of the main services have been translated into the Indonesian language and partly in Javanese, Balinese, and the Batak language of Sumatra. Orthodox.cn: You yourself are of Chinese descent. From what region of China and when did the Chinese migrate to Indonesia? What percentage of the Indonesian population is of Chinese descent? Do they still speak and read Chinese? Can you tell us how about your family background? -Fr.Dionysios: There has been a long history of interactions between China and the Indonesian archipelago. But most Indonesians do not know them well. Nowadays, in every part of Indonesia especially in cities there is always a Chinese presence. During the first nation-wide Kingdom of Sriwijaya (founded in the 7th century in southern Sumatera), there was a Chinese Buddhist scholar from China by the name of "Hui Ning (会宁)" who visited and resided in the capital of the Kingdom, to study Buddhism in the famous Nalanda Buddhist Seminary in the capital city of that kingdom. During the second nation-wide Kingdom of Majapahit (around 13-16th century), Admiral "Ceng Ho ( Zhèng Hé 郑和)" was sent from China to Majapahit to establish relations. There were Chinese princesses married to the nobles of the Kingdom of Majapahit. During the first wave of Islamic expansion in Java, the son of the last Majapahit King who had been converted to Islam, known as 'Raden Fatah" (his Chinese name: "Jin Bun") whose mother actually was Chinese, was the founder of the first Javanese Islamic kingdom. Some of the "Walisongo" (or the Nine Saints) who had brought Islam to the predominantly Hindu-Buddhist Java island were said and believed to be of Chinese descent. In modern times, the fourth president of the Republic of Indonesia (2001-2002) popularly called "Gus Dur" acknowledged that part of his family ancestry is Chinese. So there has always been movement of people from China to the archipelago. In so far as the modern Chinese population of Indonesia is concerned, there are actually four groups of Chinese who have settled in this country. These four groups are based on their language and origin in China. This modern Chinese migration into Indonesia happened between the 16th and 19th centuries. The Hokkien people came from Fukien ( Fújiàn 福建) Province, an area very important for the history of Chinese trade in the south. They have a very diligent, patient, and delicate character. They are very good at trading. So most of them are economically successful. Their migration into Indonesia reached a wide area in east Indonesia, central Java, East Java, and west Sumatra. and 3. The Teo-Chiu ( Cháozhōu 潮州) and Hakka (Khek, or in Mandarin Kèjiā 客家) people from Swatow ( Shàntóu 汕头) of eastern Kwantung ( Guǎngdōng 广东) Province in southern China. The Teo-Chiu and Hakka people were employed in mines, such as in East Sumatera, Bangka island, and Belitung. The Kanton ( Guǎngzhōu 广州) people ( Kwong Fu, or in Mandarin Guǎngfǔ 广府) were the residents of the southern part of Kwantung province. At the beginning they were interested in the Indonesian mining industry, and they came with their skills. They are the people who own shops, and blacksmiths. There are not as many of them as there are Hakka and Teo-Chiu. This classification is based largely on the degree of their assimilation and acculturation with the local people and culture. Most Hokkien (mainly men) who migrated first to Indonesia have experienced deep assimilation and acculturation, even their physical characters are almost the same as the local people due to intermarriage. Most of them have forgotten their language, and speak the local languages and Indonesian. Groups of immigrants lived in west Java, Sumatera, on small islands off the east coast of Sumatera, and West Kalimantan. There are still Totok with Chinese villages, who speak their own language and continue their culture in Indonesia. This Totok group was enlarged by later migrations (with women/wives from China in the early 20th century). In the early 1990s, Totok considered themselves as keepers of Chinese cultural ideals and maintained their traditions through household shrines, reverence for ancestors, and private language instruction (writing & speaking) in Chinese schools and homes. Highly oriented toward success, they saw themselves as more dedicated to hard work, individual social mobility through the acquisition of wealth, and self-reliance than the Peranakan. Whereas Peranakan were more likely to have settled on Java, Totok were better represented on the other islands (e.g. Selatpanjang island, Bagansiapiapi & Medan on Sumatera, Pontianak on western Kalimantan island). The government program of assimilation for the Chinese was carried out in several ways. Symbols of Chinese identity had long been discouraged and even occasionally prohibited: Chinese-language newspapers, schools, and public ritual use of Chinese names were all subject to strong governmental disapproval. In the years following independence, nearly 50 percent of Chinese Indonesians failed to seek Indonesian citizenship, either because of continuing loyalty to the People's Republic of China or the Republic of China of Taiwan, or because of the prohibitive costs of gaining citizenship papers. To carry out its stated policy of assimilation in a period of rapprochement with China, however, the Suharto government enacted new regulations in the 1980s designed to expedite the naturalization of persons with Chinese citizenship. The assimilation policy was successful. By 1992 only about 6 percent, or 300,000 out of approximately 15 million Chinese Indonesians (at most: 3% of the population of the country) were acknowledged by the People's Republic of China as being Chinese citizens. Regulations announced in June 1992 by the director general of immigration allowed immigrants from China who had lived illegally in Indonesia for decades to receive entry permits and to reside legally in Indonesia once they obtained a Chinese passport. As a result of the different treatments based on social status during the Dutch colonial period, they did not want to be classified as locals. This attitude was strengthened by Chinese Nationalist propaganda during the 20th century—this propaganda of re-orientating their nation. This led to a return to the Chinese patrilneal system or nationality based on blood relation called ius sanguinis. Prior to 1955, this policy had caused double nationality. The most important consequence was a growing awareness of the Great China family or a simple process of Totokinization. In general most Chinese in Indonesia work in trade, especially the Hokkien. In West Java and West Sumatra they are farmers. In Bagan Siapi-api (Riau) the Hokkien are fishermen. The Hakka in Sumatra work at mining, while in West Kalimantan they are farmers. The Teo-Chiu work as farmers but many also labor on farm estates in East Sumatra. The trade of Chinese in Indonesia is based on family ownership and management. Most are small size and do not need outside workers. If their business grows, they open a new branch which is given to their brother, child or any other family member to manage. If they build a limited corporation, then they work with other Chinese clans or even other ethnic groups if they consider such cooperation profitable. The Totok consider the Peranakan to be lower class due to their mixed blood, while the Peranakan consider the Totok to be lower class as they all came to Indonesia as laborers. During the Dutch colonial era, the Chinese lived as if they were an autonomous society, and they were permitted to rebuild their own culture in Indonesia. When their ethnic identity became strong, the Dutch realized the situation and closed all educational institutions that belonged exclusively to the Chinese. During the Japanese control of the Dutch East Indies, all western schools were closed, and again Chinese schools were rebuilt. After Indonesian independence, all educational facilities and systems were reorganized and adjusted under the basic constitution of Indonesia, which states that educational facilites are to be for everyone, and no special treatment is allowed to exist. Since 1957, all Indonesians have had to follow the rules with no exception for any ethnicity. The kinship system of the Chinese in Indonesia is almost the same as that of the main ethnic cultures in Indonesia. The only difference is that their family unit is much bigger ( big virilocal ). The status of women in the past was low. A woman was subordinate to her husband, brothers, and their parents-in-law. Men sought to have boys and could take more women as wives until a son was born. I, Fr. Dionysios or "Lim Eng Chiang ( Lín Róngqiáng 林荣强)," consider myself to be a "Peranakan," as I do not speak Chinese, while my wife ( presbytera Artemia Rita) I consider to be a "Totok," because her domestic language in the family is Chinese (i.e. Hokkien and Mandarin). Both of our parents are still alive and healthy. (My father recovered from a brain tumor, thanks to the Red Fruit Juice or "Sari Buah Merah" from Papua, given to us by the kind benefactors Mr. David Hadiningrat & Mrs. Christine Photini). My father "Lim Ho Tjoean ( Lín Huòquán 林和全)" can speak Hokkien a little bit, because his grandfather came straight from Fukien in southern China. My mother (from the Hokkien people) "Tan Tjoei Tie Nio ( Chén Shuǐzhìniáng 陈水智娘)" can speak Mandarin (Pǔtōnghuà 普通话) a little bit because she went to a Chinese school for a while. (It was then closed down by the Japanese occupation forces.) She was born in Lahewa village (devastated just now by the earthquake of March 28; my "Shaie," i.e. my mother's elder sister, was killed together with her husband, crushed by the falling roof of their concrete three storey home) on the island of Nias. At home, we speak the Indonesian language "Bahasa Indonesia". My presbytera Artemia Rita, born "Hoang ing ing ( Huáng Yíngyíng 黄莹莹 )", still speaks Hokkien and Mandarin in her home (when we visit her family). She learned Chinese characters in her primary school on Selatpanjang island. Then she went to Jakarta for her secondary & high school and university education and seldom wrote in Mandarin. Her father "Hoang Beng Sun ( Huáng Mínshùn 黄民顺)" and her mother "Lim Pek Luan ( Lín Báiài 林白嬡)" speak, write and read Mandarin / pu tong hoa. (They watch Chinese TV Programs from PRC and Taiwan by satellite, read the Christian Bible & newspapers in Mandarin, and speak Mandarin to their five-year-old granddaughter and two-year-old grandson i.e. my niece and nephew). I hope to learn to speak Mandarin together with these nieces and nephews while they are growing up. Orthodox.cn: Recently, six priests including you were ordained by His Eminence Archbishop HILARION of Sydney and the Diocese of Australia and New Zealand. How were you introduced to Orthodoxy and what led you to decide to join the priesthood? -Fr.Dionysios: I was educated as a Roman Catholic, and I studied philosophy in a Roman Catholic university including a two years post graduate program. Upon completion of the entire course of study, I began a career in teaching Roman Catholic theology. However, when in 1999 I met my wife-to-be, Presbytera Artemia, I began to question many aspects of Roman Catholic theology and practices. With the agreement of my wife-to-be, we were searching for the true apostolic faith, and it happened that when we were in Singapore (I myself stayed in this city country for six months starting around the time that the rioting and looting occurred in Jakarta in 1998; when I visited the historic cities of Melaka and then Kualalumpur, I did not see any Orthodox Church there), we saw on a map the "Armenian Church". We then visited the "Armenian Church" at Hill street in Singapore, and through the Orthodox priest there we made contact with Archimandrite Daniel Byantoro, and the search of Orthodoxy began in earnest with the guidance of Archimandrite Daniel Byantoro. At last we decided to become Orthodox and were married by Archimandrite Daniel Byantoro in the Orthodox Church. 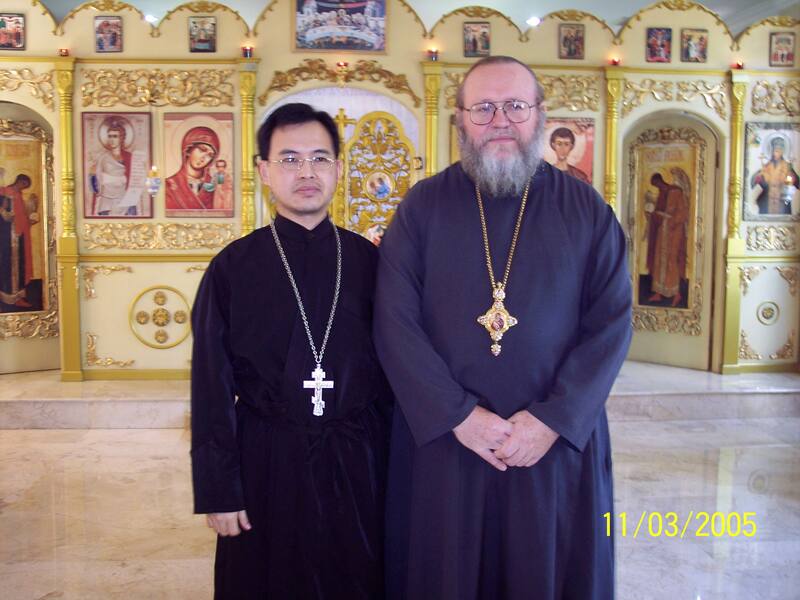 Finally in September 2001 Archimandrite Daniel Byantoro invited me to Jakarta to learn the Orthodox faith more deeply and to help him in his ministry. The more I learnt the more I was drawn into the calling of becoming an Orthodox priest. Finally I was able to go to Russia, for a year to deepen my understanding in Orthodoxy, until I was ordained by His Eminence Metropolitan HILARION. Orthodox.cn: The earthquakes and the devastating tsunami last December has caused much untold disruption in people's daily lives. International Orthodox Christian Charity and the Office of Philanthropy of OMHKSEA have joined many relief organizations in bringing back some sense of normalcy to the country. How has this affected parish life in the Orthodox Church, and what role has the Orthodox Church played with the humanitarian relief effort. 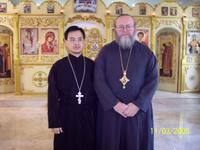 -Fr.Dionysios: The Orthodox Churches and communities throughout East and South East Asia (eg. in Hong Kong, in Jakarta, in Medan-Sumatera) have offered prayers, help and donation to the victims of the devastating tsunami. It is for the glory of the Lord’s name! This is a testimony and example of the Orthodox Christian faith responding to their suffering fellow neighbor human beings. May the Holy Spirit of God strengthen them who are suffering. May He grant in turn the Orthodox communities in the region one moment of a spiritually fruitful reflection. Thus we are to live on this blue planet with unconditional and forgiving love of our Lord. Then, when the time comes for us to leave this world at any moment, we in peace and joy may face our Creator WHO forgives and has mercy on us. Realizing the Lord’s forgiveness and mercy for us, it is a proper thing that we are to forgive and have mercy for others. Orthodox.cn: You were also granted to establish an Orthodox community in the city of Pekanbaru of the Province of Riau, on the island of Sumatera, Indonesia. The community is named after the Chinese martyrs of the Boxer Rebellion, St Metrophanes and his presbytera St Tatiana. What is your vision for this community and are there missionary opportunities among Indonesians of Chinese descent? Are there any obstacles? -Fr.Dionysios: Answering shortly, based on the teaching of St.Justin Martyr about "Logos Spermatikos", the vision is to bring the pearls of the Chinese-Indonesian's way of world-view and beliefs into the fullness of the Lord's light. We are looking to the future with optimism, and with the newly recognized basic human rights for the Chinese-Indonesians, we believe that these people will come forward to the light of the national stage to contribute to the development of their "tanah air" / country Indonesia based on a firm commitment to truth and justice, nurtured by the Orthodox faith of the Apostolic Church with Chinese-Indonesian characteristics. Some of the obstacles are of a transitional nature, i.e. how to gather people to worship in a place not yet formally and legally recognized as a house of worship without upsetting non-believing neighbors and the authorities. The Parakletos help us, The Lord be with us, The Holy Trinity bless our work, Holy Theotokos pray for us, the guardian Angel keep us safe; the holy fathers and saints and martyrs be our example. priest Dion. & presbytera Artemia Rita.